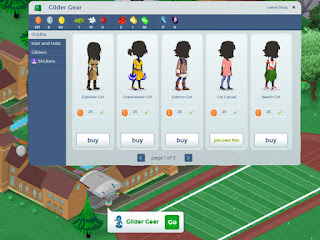 Have you checked out Glider Gear yet? It is a shop in Lightglider Academy where you can get new outfits, hats, gliders, and stickers to use for your Postcards or for your Glidebook journal. It's worth taking a look! Sometimes I go into the Yonders just to gather materials so I can buy a new outfit to wear around the Courtyard. It's also fun to dress up for our theme weeks and parties! i love and have those outfits, there so cute & cool.. and nobody is vain for wearing something they like.